Israeli claims about supposed Palestinian crimes are often psychological deflection, argues Asa Winstanley. Sigmund Freud defined ‘projection bias’ as a form of defence in which feelings are displaced onto another party, where they then appear as a threat from the external world. This is a phenomenon that you come across quite often when studying Israel’s apologists. Like the partisans of other colonial movements, Zionists are quite prone to denying their own crimes while at the same time projecting them onto their enemies. Take “human shields”. This is a trope you come across quite a lot in the propaganda of the Israeli army when it is trying to explain and apologise for its war crimes. As in the case of their 2008-2009 attack on the civilian population of Gaza, they claim the civilian casualties were not their fault because Hamas and other armed Palestinian groups used Palestinians as ‘human shields’. In fact, as Norman Finkelstein often underlines, multiple reports on the 2008-2009 attacks on Gaza, issued by respected human rights groups (such as Human Rights Watch and Amnesty International), as well as the UN’s Goldstone report, say otherwise. They found no evidence that any such thing took place – despite being highly critical of Hamas and other groups for armed attacks on Israel. Yet the same human rights groups often document many cases of Israeli soldiers using Palestinian civilians as human shields to discourage armed resistance. There have been numerous instances of Israeli soldiers forcing Palestinians, often no more than children, to walk at gunpoint into houses which they then ransack and search. They sometimes take over such homes and hold the families inside hostage (see, for example, Amnesty International, “Gaza civilians endangered by the military tactics of both sides”, 8 January 2009). The armed attack near Eilat (far in the south of Israel-Palestine – a long distance from Gaza,) on Thursday (18th Aug) reminded me of this phenomenon too. 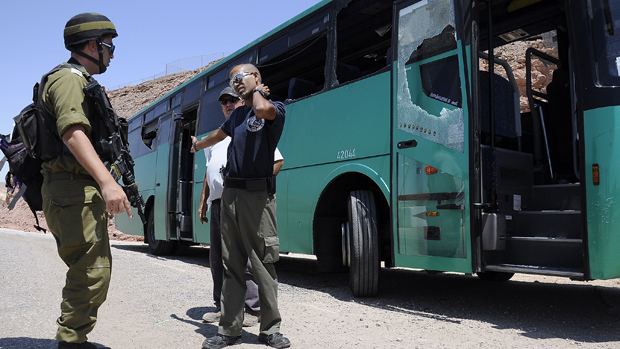 Although some Israeli press reports referred to an attack on a civilian bus, it seems from what evidence is available that the bus was full of Israeli soldiers moving from a base. The very first reaction the Israeli army press office put out on its official Twitter account was “5 #IDF soldiers injured from shooting @ #Israeli bus”, though this line soon changed. Press photos of the wounded, however, clearly show the casualties wearing Israeli army uniforms. The Egged Bus company (who it seems operated this line) does run public transport in Israel. But you might well ask what the Israeli army was doing transporting its soldiers down to Eilat using the public transport system. This is a common Israeli practice. When I lived in Palestine, on the few times I had to travel to Tel Aviv from the West Bank (via Jerusalem,) walking around the public bus stations I was struck by the sheer number of armed, uniformed soldiers who used the public bus system. Anyone who has used buses in Israel for any length of time will tell you they often have more soldiers than civilians on them. The phenomenon is so widespread that it can only be a deliberate policy. Does some $3 billion a year in military aid from the US government not provide it with enough funding for its own troop transportation? So Israel not only uses Palestinians as human shields, but it even “hides” its soldiers amongst its own civilian population – exactly what Israeli spokespeople accuses Hamas of. Talk about projection. Let us be clear: any attack on civilians, by any party, is against international law and morally wrong. Israel is the prime perpetrator of targeting Palestinian and other Arab civilians. Indeed, its very first instinctual “reaction” Thursday night was to bomb civilian targets in Gaza (including one home Israel said belonged to a fighter from the Popular Resistance Committees,) killing six Palestinians including at least one child. The PRC have denied involvement in the Eilat attack: “The occupation wants to pin this operation on us in order to escape its own internal problems” a spokesman told the AFP agency. It is worth noting that the spokesperson also defended the Eilat operation, so it seems to make little sense that he would lie about any involvement. The attacks on Palestinians go on, and the death count is rising as I type. Israel regularly bombs Gaza, just a few days ago, it invaded the central Gaza Strip and killed a teenager, shooting him “more than 10” times in the head and body, according to medical officials, but the Western press seem not to notice it, unless and until they have Israeli casualties to report too. The conflict over Palestine will only end once Israelis face up to the reality that they are occupiers running an apartheid state, and stop projecting their own image onto the natives they are occupying. This change will not come from within Israeli society: there are no examples in history of an occupying power voluntarily giving up on colonialism. It will only come about through Palestinian resistance, of various forms. Armed resistance against military targets is legal under international law, a right that everyone living under occupation can exert. Edward Said once said: “I think it’s important to attack occupation forces… occupation, apartheid has to be resisted”. Of course, the Palestinians also have, contrary to persistent Western illusions, a very long and remarkable history of non-violent, popular resistance, which we in the West can continue to sustain and support through the ‘Boycott, Divestment and Sanctions’ movement. Asa Winstanley is a freelance journalist based in London who has lived in and reported from occupied Palestine. His first book “Corporate Complicity in Israel’s Occupation” will be published by Pluto Press in October. His Palestine is Still the Issue column appears in Ceasefire every other Saturday. His website is www.winstanleys.org. thank you for this deep insight. It is impossible to defend the more extreme reactions of Israel, equally it must be said it is impossible to defend any forms of violent action,in any shape or form or indeed for whatever reason it is claimed they are neccessary. It is however perhaps helpful to study something of Jewish history and in doing so to learn that Jews have throughout history been more than any other group of people in history, been vilified, abused and brutalised, the final horrific and unspeakable chapter being the hollacaust. Examine if you will, what actually happened in the hollacaust and you will sense the full horror of what was done, and indeed how. The Jews throughout their history have always remained passive when faced with hatred, violence and aggresion, and indeed in most cases remain so, and it must be said that in the arts, the creative and intelectual world and indeed ‘humour’, they have made a greater contribution to thoughtful civilised debate and the advancemengt of knowledge than almost any other group of people. In israel however we see the change in atttitude driven by bitter experience. Surrounded from its inception by a hostile Arab world, sworn to drive Israel and the Jews into the sea and effectively create a new holocaust, Israel initialy remained calm, and as is ‘the Jewish way’ tried to create an ‘association’ with their neighbours, which would benefit all. This was and always has been rejected! Therefore surounded by neighbours with radio broadcasts constantly broadcasting obscene disgusting antisemitism, and then the finding their Palestinian neighbours were sending women and children loaded with high explosives into and onto buses and markets and other Jewsish areas, and in doing so murdering countless innocent people, the Israely attitude slowly hardened into what we now see. It should be remembered that the violence, aggression and brutality was not (NOT) started by Israel but by Palestine and the Arab world, they effectively created the situation that now exists. Arrafat was the real enemy of the Palestinian cause, a biggoted, racist, violent, ignorant egomaniac, this man could have accepted the deal brokered by the USA, but instead, realising that it would benefit the Palestinian people but would in doing so, make him obsolete, he sold Palestine into chaos. I do not defend Israel, nor do i defend any violent action, for they are all wrong,morayt, ethicaly in every sense, they are the darkest appaling manifestation of male-ness and machismo, whether in the middle east or on the streets of London. It is the deep scars and psychological insecurity of it’s appaling history, that lays behind Israels actions, and it is the biggoted hatred and blind machismo of Hammas and Arrafat inheritance, and indeed the biggoted racist doctrine of fundamentalist Islam, that blinds Palestine and the Arab world. Let us hope and pray that at some point reason, compassion and civilised argument and engagement will bring an end to all the violence and hatred that seems so easily to manifest itself, rather than simply the possibility of peace love and harmony! Finaly,to accuse Israel and indeed Jews in general of being ‘Nazi’s’ is perhaps the greatest obscentity of all, for those who say this,perhaps study history and educate yourselves to who and what the Nazi’s were and what they actually did! Indeed a good case could be put for comparing fundamentalist Islam with National Socialism! Can’t you at least update your propaganda for the current decade? Or at least try even addressing what my article says. How many other places have you copied and pasted that? Asa! I do NOT, as you quite obviously do, seek to condone, justify or excuse violence for any reason whatsoever, be it from Palestine, Israel or any other source! You on the other hand seek to list chapter and verse in the justification of violent fanaticism., and if you read what i previously wrote from a position of understanding without emotion and with simple reason, you will see that i most certainly addressed your article. The fact is, that there is no other civilised way than the way of reason, whatever peoples imagined differences, they must simply sit together and talk through their differences and arguments! any other course ,leads simply to chaos and increased suffering! The problem is always that of leadership! In the case of Israel a hardening of attitude, where the more right wing view holds sway! In the case of Palestine and unfortunately most of the Arab world , an often fanatical hatred of Israel and indeed Jews in general driven by a racist bigotry helped and driven by the often deplorable racism and utter inability to see ‘the other view’ of much of the Islamic world. I have i may add many, many Muslim friends who aggree with me,just as i have many Jewish friends who deplorte Israel’s actions. Once again, the ONLY way forward is for people to set asside their assumed differences, most of which are and have always been evoked and driven by ‘leaders’ with their own agendas to advance, and simply engage with each other. Put away the guns, take away the political agendas, leaders, religion, experts and media, and you would be amazed how well people of every background, colour, and ‘way’, are capable of simply getting along with each other. People who wish to fight are deluded and often mentaly ill! most people do not wish to fight over anything, this applies as much in Palestine and Israel as anywhere else! It is people like yourself obessesively in love with your biggotry and justification, that seek to persuade them that they should do so! The only cause is peace and harmony, and this is never achieved at the point of a gun, however much you believe it can be! I am sick and tired of fanatical sexualy repressed men with guns throughout the world screaming and shouting and celebrating their lunatic machismo, while others suffer for their actions! Free your mind Asa, and all the real deluded hate filled propagandists you represent! Every day Israeli are killing young Palestinians coming in the age of procreation. This low genocide is planned by the zionist enterprise in Palestine since at least 1967. Sharon said once: “we should have finished with the arabs in 1948, now it is more difficult”. This means that the Naqba should have taken place in the whole historic Palestine. But this could not have been done at that moment because of the inacceptance of the international community. I completely agree with you about the projection bias of israeli war crime apologism. This propaganda is not new. All colonial powers criminalised in the past the oppressed and labeled them as terrorists by many means. But what Israel ignores is the anachronic situation. Humanity has came over colonialism and apartheid, this belong to the dark past of our common history. Israel as a colonial apartheid state in the 21st century is a western made monster feeded by all western powers. It is up to the world’s civil society to bring an end to that horror. There is still the pressure of Israel and maybe all western governments to bomb Iran, after having destroyed Irak on false accusations. Israel and the hysterical US congress are really a very dangerous for all of us. Its tribal behaviour is insulting every day our dearest wish of brotherhood in this small world. It is our conscience of brotherhood and healthy environment which marks the 21st century and not nuclear boms hidden in the israeli desert ready to bring death to the earth. I just find it scary that Israel has no problem doing what Nazi Germany did to them. What they are doing is genocide. Burying homes and people, bombing schools and refugee camps and keeping a whole population deprived is atrocious. To have gone through something as atrocious as the Holocaust and then to put another human being through the same is heinous and a crime against humanity.